Wine experts are advising aspiring wine connoisseurs and those looking to earn some extra cash that now is an opportune time to invest in good-quality Australian wine. Demand for single-site Australian wine has grown exponentially in recent years, so much so that East End Cellars owner Michael Andrewartha has resorted to strategically allocating his stock. “We’re seeing a lot of interest coming from local buyers but also out of Hong Kong, Singapore, China, [and] Denmark,” Andrewartha says. Much of this demand has been driven by an increase in the number of wine investors who purchase young wines with the intention of leaving them to age and increase in value. Provided the quality and reputation is there, wine investment can be a prosperous venture. “I’m not a fortune-teller or financial adviser; all I can go on is past history,” Andrewartha says, when pressed on how much wine can increase in value. “Wine value can go up 10 to 15 per cent a year – that’s for a good-quality wine. Fifth-generation winemaker Stephen Henschke of Henschke Wines, which is hosting a vertical tasting of Shiraz from its Mount Edelstone vineyard at this month’s Tasting Australia, says now is an opportune time for people to consider putting down wine to age. “Now that we have an international market for Australian wine, the value of the wine has increased because of the demand for the wine over a larger market,” he says. “The average Australian consumer is more knowledgeable [in wine] than in most countries in the world, probably because we’re a smaller nation and we’re more involved in our history and our heritage. 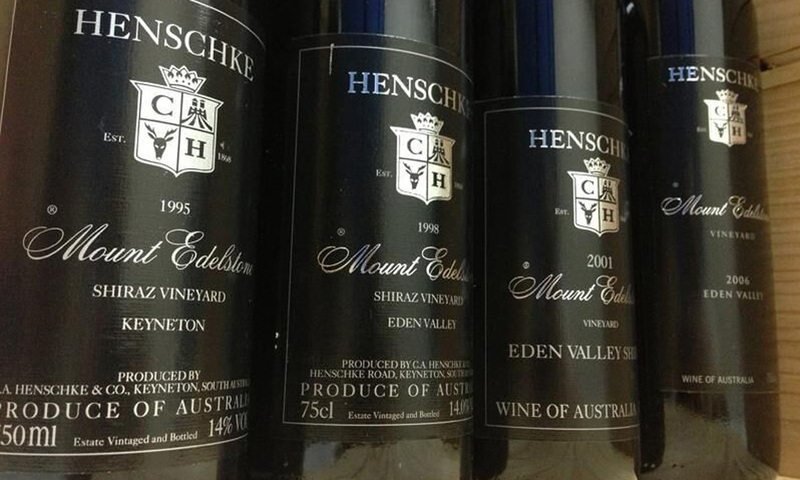 Henschke Wines will present a vertical tasting of its Mount Edelstone Shiraz at Tasting Australia. Both Henschke and Andrewartha recommend novice investors research and taste wines and establish a relationship with their local wine merchant. “Always buy quality single-site wines and make sure it’s from a reputable producer,” Andrewartha says. Andrewartha suggests medium-priced South Australian labels including Spinifex Wines, Kaesler Wines and Rusden Wines as good starting points. “These are a range of wines under $50 (a bottle) that will certainly pick up on price,” he says. To test a wine’s quality and ability to age, Andrewartha recommends removing the bottle cork and leaving the bottle in a cellar overnight. “If it’s good if not better after that 24-hour period, it’s worth keeping a decade. Wine enthusiasts will be able to gain a deeper understanding of how a single-site wine evolves with age at the Henschke Wines vertical tasting masterclass, which is part of the East End Cellars Masterclass series in the Tasting Australia Town Square (in Victoria Square). Taking place on April 14, it will feature 10 Mount Edelstone Shiraz vintages from 1986 through to 2013. “They [the vintages] are really quite precious and rare now, even in our cellars,” Henschke says. “There’s a lot of spice and perfume in the young wines but over time as the wines age the primary characters change into more secondary characters, [so] you see a huge variation between vintages. Henschke Wines Mount Edelstone Vertical Tasting will take place at East End Cellars Masterclass Pavilion at Town Square on April 14 as part of this year’s Tasting Australia festival. Further information is available here.